The lady carrying these roses was trying to sell these roses on a busy street but no one even cared to buy one.I stood there for a minute watching her say "$1 please buy one" to almost everyone passing by. A glance at her made me feel she is a beautiful cinderella on the street which no one could see.All I could make out was that those roses might be her bread and butter.But life of the street seems to be no bed of roses for her. This was a little difficult shot as it was busy street with too many people passing by and I didn't want to distract her either with my lenses on her. 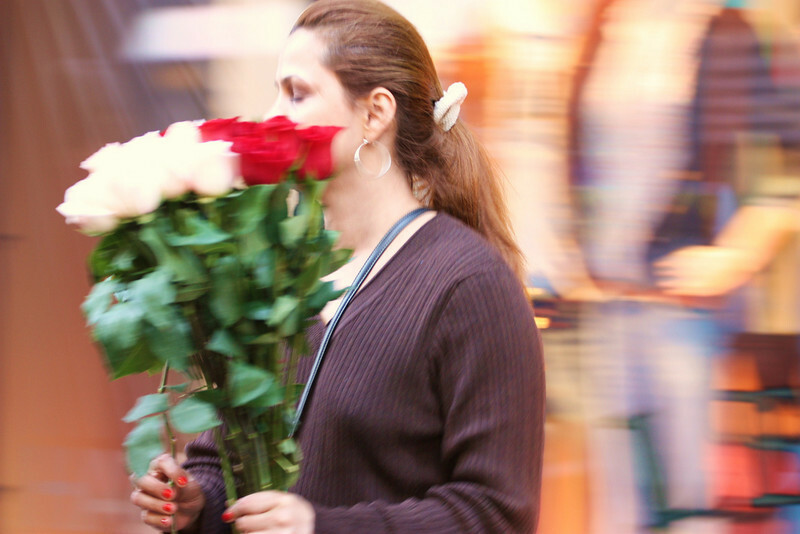 I tried to go near her to buy a rose but then she was lost in the sea of people on the street. Though I am not very satisfied with clarity of this picture ,I felt she deserves a place in my daliy showcase. This is really lovely...funnny how sometimes a shot that is not 'classically' a good shot, but really engages us visually and in our heart. This one did for sure. Beautiful image..shame you couldn't catch up with her..Lovely shot! Lavanya, this is a beautiful capture and your words add life to it. We never know what someone else is going through or how hard their life might be. Very moving story behind this shot -- and I like the sense of movement you've captured! Nice shot. Like the words of wisdom! Nice idea and execution ! Cool shot! I really like the sense of motion! I like the motion blur around her.